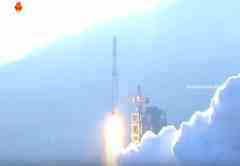 On February 7, North Korea televised the launch of a rocket that put an “earth observation satellite” into orbit (KCTV, February 6; Xinhua, February 7). South Korea’s spy agency earlier announced that the launch should be viewed as a ballistic missile test, rather than a routine rocket launch (Yonhap, February 7). The launch comes on the heels of a test of a thermonuclear device in the mountains near North Korea’s border with China (Phoenix News, January 6). Both actions have received strong condemnations from the international community, putting North Korea’s relations with its closest ally, China, in the spotlight (People’s Daily, January 7). China’s response has indicated that it is less than pleased with North Korea’s recent behavior. Chinese Minister Foreign Ministry Spokesperson Hua Chunying announced that Foreign Ministry Vice-Minister Liu Zhaomin summoned North Korean Ambassador Ji Jae Ryong to propose talks about North Korea’s use of guided missile technology to launch a satellite (Xinhua, February 7). The test of a nuclear device in January was expected to reinforce China’s resolve to further pressure North Korea to halt its nuclear weapons program. China has made its call for a “de-nuclearization of the Korean peninsula” a regular feature of its statements regarding foreign relations with both Koreas. Growing friction between the long-time partners has been evidenced by the absence of a meeting between Chinese President Xi Jinping and North Korea’s Leader Kim Jong-un. Meanwhile, relations between Xi and Kim’s southern counterpart, South Korean President Park have clearly grown stronger (China Brief, September 16, 2015). However, although Chinese high-level diplomacy with North Korea has faltered, the nuclear test and rocket launch have placed China on the defensive, raising the possibility that China will be less well-placed to play a role in preventing conflict on the peninsula. For its part, North Korean Ambassador Ji held a news conference in July last year where he specifically laid out North Korea’s rationale for its nuclear program, saying “North Korea’s nuclear deterrent is in response to the United States’ nuclear threat…and is an indispensable means for protecting [North Korea’s] sovereignty and existence (Phoenix News, July 28, 2015). China’s response reflects a more complicated reality. The Yellow Sea, which separates most of eastern China from the Korean peninsula, is a vital area for trade. Four of the world’s ten busiest ports are Chinese ports on the Yellow Sea: Tangshan, Tianjin, Qingdao and Dalian (Global Times, August 20, 2015). The Shandong and Liaoning peninsulas, stretching to the northeast and southwest, enclose the Bohai Sea, which is home to vital economic centers Tianjin and Dalian on the coast and Beijing nearby. Geography in turn shapes in the way China views its regional security. China is in the midst of a military reorganization that has resulted in a reconfiguration of its troop deployments, now concentrated in five strategic directions, including, the important Northeast Theater Command that is responsible for crises on the Korean peninsula (see The PLA’s New Organizational Structure Part 1 in this issue). The Second Artillery (now reorganized as the Rocket Force) has four launch brigades under Base 51 in the provinces bordering North Korea. Strong Chinese objections to US deployment of Terminal High-Altitude Area Defense (THAAD) missile batteries in the region, have to be viewed from the perspective of how they degrade China’s conventional and nuclear deterrent. The fact that North Korea’s actions have now prompted South Korea to begin talks with the United States to acquire a THAAD battery will only exacerbate these fears (Yonhap, February 8). U.S. military exercises in the region have long been a source of concern for Beijing. Though publically announced and focused on fighting a war with North Korea, the annual joint U.S.-South Korean “Key Resolve” and “Foal Eagle” military exercises are uncomfortably close to core Chinese strategic bases and often feature drills that could be used against the Chinese military. In 2010, for example, the U.S. aircraft carrier Washington joined exercises in the Yellow Sea, leading to strong Chinese objections (Global Times, June 9, 2010; People’s Daily Online, June 23, 2010). This year, “Key Resolve” is scheduled to begin in March (Yonhap, January 13). If 2015 is any guide, we can expect North Korea to respond with its own series of ballistic missile launches in response to these exercises that may further heighten regional tensions (People’s Daily Online, March 3, 2015). The security situation along China’s border with North Korea is already problematic. A series of incidents involving North Koreans murdering Chinese citizens has already prompted strong popular resentment of their recalcitrant neighbor, which has been only further exacerbated by North Korea’s dismal image in the international community (China Brief, July 2, 2015; China Brief, January 9, 2015). Between the prospects of a unified, western-aligned Korean Peninsula (and the inevitable refugee crisis along its border resulting from any war of unification) and an increasingly fractious relationship with its neighbor, China will likely choose to preserve the latter at any cost.